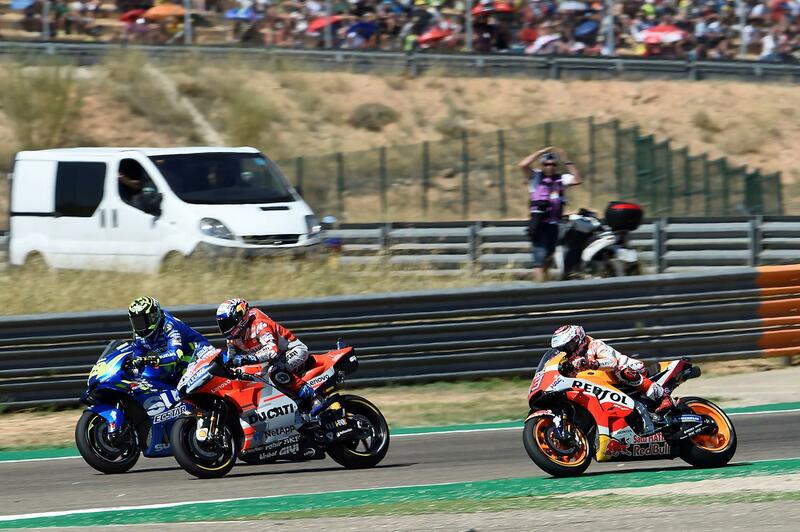 MotoGP championship rivals Marc Marquez and Andrea Dovizioso remain divided on whether this season’s championship remains up for grabs, despite a dramatic victory for the Repsol Honda rider in Sunday’s Aragon Grand Prix. Marquez now leads the Ducati rider by 72 points with only five rounds left, making it realistic that he could wrap up the title in Japan in only three weeks’ time. Despite looking stronger than ever to hold off the attentions of both Dovizioso and Andrea Iannone in Sunday’s scrap at Motorland Aragon, the reigning champion is adamant that there’s still plenty of opportunities to lose everything if he’s not careful. “The job isn’t finished yet, and it won’t be until I’ve got enough points to make sure I can’t be overtaken. But we could make the mistake now of thinking that it’s already there. I did that in 2014, thinking of the championship in Europe before the final flyaway races, and I crashed for two races in a row. But while Marquez has all the pressure on his shoulders going into MotoGP’s longest-ever four-race trip to Asia starting in Thailand in two weeks’ time, Dovizioso isn’t under any illusions about his chances of wresting Marquez’s crown off him. Essentially needing nothing short of something to take Marquez out of contention for two of the remaining rounds – and even then, to still win the season’s remaining races – he admitted after the race that his hopes are slim.